These funds continue to charge high fees for basic index exposure, and many investors are still paying up, largely thanks to advisor inertia. When Vanguard Founder Jack Bogle introduced the first index fund to the American public in the 1970s, he wasn’t promising that it’d outperform the markets. Rather, the promise behind index funds was to diversify across and track the performance of the overall market at a low cost to the investor. Today, you can invest in the Vanguard 500 Index Fund for as low as 4 basis points. But some legacy index funds—which track the exact same index—charge much, much higher fees than that, and investment gurus say they are simply unjustifiable. Such high-fee index funds are relics of a time when investors didn’t bat an eyelash at their expense ratios—or more likely didn’t know to ask and weren't explicitly told. Most of these index-mirroring funds are Class C shares that get most of their deadly annual price tag from 12b-1 fees, most always levied at the maximum allowable 1 percent. Much of those “marketing and distribution” fees go to providing brokers with their trailing 12-month commissions. This remains a dark and increasingly archaic corner of the financial services world, yet many investors still live there either due to broker inertia or “set it and forget it” retirement programs. The Rydex S&P 500 Index Fund—often considered the poster child of high-fee index funds—charges a net expense ratio of 2.33 percent. That includes a management fee of 75 basis points and 1 percent 12b-1 fee, a reward to the advisor for selling the fund. But there are more than a dozen similar, plain vanilla funds—also tracking the S&P—with net expense ratios over 1 percent. Federated Investors, State Farm and Invesco are just a few providers. Defenders of 12b-1 fees say the trailing commissions are meant to compensate the advisor for providing advice to the client that bought the fund; the client's costs would be the same in a fee-based account. But that argument is increasingly dubious, industry watchers say, as the gap between what these funds charge and low-cost alternatives is widening. State Street now charges 2 basis points for its Equity 500 Index Fund. Fidelity recently introduced index funds with zero expense ratios. “Where we stand today, there’s no excuse that anyone should have to pay fees that are just downright egregious for exposure to mainstream indexes, exposures that can be had for next to nothing if not, in a small handful of cases, nothing in specific channels,” said Ben Johnson, director of global exchange traded fund and passive strategies research at Morningstar. 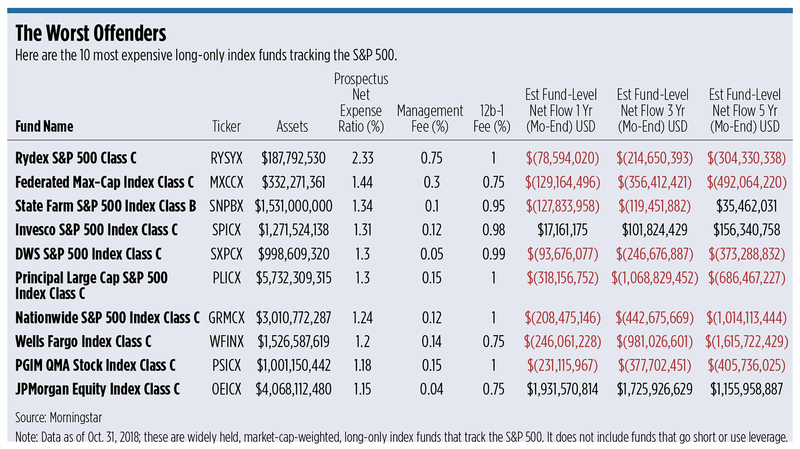 Despite the prevalence of low-cost options, many investors are still in these funds. According to an analysis by Morningstar, the top 20 most expensive S&P 500 index funds had $57 billion in assets combined. The State Farm S&P 500 Index Fund, for instance, with a net expense ratio of 1.34 percent, has more than $1.5 billion in assets. “For the time being, there are some unfortunate souls out there paying many, many multiples of what can even be considered borderline reasonable for index exposure,” Johnson said. Advisors are largely to blame for their persistence. Scott MacKillop, CEO of First Ascent Asset Management, a turnkey asset management platform, says these funds tended to be sold by the larger brokerages, where a broker is incentivized to sell them. Many advisors likely put their clients’ portfolios in these funds years ago, where they remain out of sheer advisor inertia. And unless the investor is proactively doing the due diligence themselves, they’re stuck. “The easy way out is to pick a mutual fund, leave it in there forever, and don’t see if there’s better alternatives or see if anything has changed,” said Todd Rosenbluth, director of ETF and mutual fund research at CFRA. “Even an index-based strategy warrants ongoing due diligence. In many cases, these index funds came about as a way to round out a portfolio of funds made available in 401(k) menus, Johnson says. There’s a lot of inertia there, he says, given that plan sponsors might be reticent to change. In these cases, the individual plan participant often has no other choice if there aren’t lower-cost index options in the retirement program. And for investors who are stranded in these funds over long-time horizons, those high fees could negatively impact their ability to reach their investment goals. MacKillop says there are things these sponsors could be doing differently that may justify slightly higher expenses. For instance, they could be replicating the index without buying all 500 stocks in the index. They may buy a representative sample, say 100 names or so, and this would save transaction costs. A lot of separately managed account products take that approach, he says. They could argue that they have some sort of trading advantage. Dimensional Fund Advisors, for example, touts their trading skill. But even so, he says, those advantages don’t justify the expense ratios these funds are charging. “It’s almost impossible to imagine that Rydex would have a trading advantage over Vanguard, for example,” MacKillop says.